Russia has launched a Soyuz-2-1b rocket from Plesetsk Thursday carrying a Tundra missile detection spacecraft, ending a year-long gap in Russian military satellite launches. Liftoff occurred on schedule at 09:33 Moscow Time (06:33 UTC). Thursday’s launch carried the second satellite for Russia’s EKS missile early warning system. EKS, or Edinaya Kosmicheskaya Sistema – meaning Unified Space System – is a replacement for the Soviet-era Oko early warning system. Consisting of a minimum of eight satellites in elliptical Molniya orbits, the constellation is intended to provide global coverage to detect and track missile launches. The EKS satellites, also known as Tundra, are being constructed by RKK Energia, based on a satellite bus that the company has named Viktoria – which is derived from the four Yamal communications satellites built by Energia in the late 1990s and early 2000s. The satellites are equipped with infrared telescopes to detect heat sources – such as the exhaust of a missile – as well as optical and ultraviolet sensors. The Molniya orbit which EKS uses is a special class of elliptical Earth orbit. With a perigee of around 1,620 kilometers (995 miles, 864 nautical miles) and an apogee of around 38,500 kilometers (23,900 miles, 20,800 nautical miles), the orbit has a period of twelve hours. Its inclination of 63.4 degrees negates precession of the orbit’s argument of perigee, keeping the satellite’s apogee over the Northern hemisphere. The satellites reach apogee twice in a day, on opposite sides of the planet, while the orbit’s high eccentricity means they spend most of their time close to apogee. The Molniya orbit is named after the Soviet word for lightning, which was the name of a series of communications satellites which previously used such orbits. The Oko system also used satellites in Molniya orbit, in conjunction with geosynchronous spacecraft and ground-based radars. 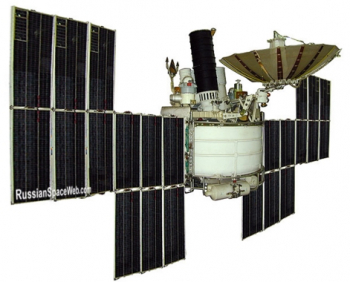 Oko’s US-K Molniya-orbit spacecraft were launched aboard Molniya-M rockets with Blok-2BL upper stages between 1972 and 2010, while the geosynchronous element of the constellation used US-KS and later US-KMO spacecraft launched by Proton-K rockets with Blok-DM and DM-2 upper stages. A key improvement of the EKS system over Oko is that EKS satellites do not just detect missile launches, but can also track the path of the missile’s flight. This function was previously fulfilled by ground-based radar stations, switching to a space-based approach will allow Russia a faster warning of potential targets. 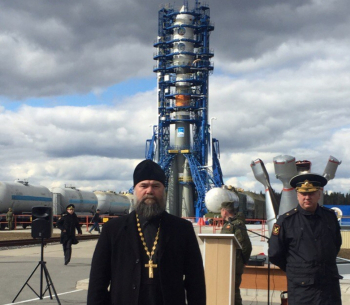 The first EKS satellite, Kosmos 2510, was launched on 17 November 2015. Further launches are expected over the next few years to bring the constellation up to full strength with eight spacecraft. Thursday’s mission was Russia’s first military launch since 4 June last year – one of the longest gaps between Russian, or formerly Soviet, launches in history. A reported budget squeeze, coupled with reliability concerns and manufacturing problems has seen Russia’s launch rate – usually the highest in the world – drop significantly over the last twelve months. The Tundra launch was Russia’s fifth orbital launch of 2017, compared to eleven by the same date in 2016. The four previous launches – all of which also used Soyuz rockets – consist of the unmanned Progress MS-05 and manned Soyuz MS-04 missions to the International Space Station, as well as two commercial launches conducted by Europe’s Arianespace from the Centre Spatial Guyanais in Kourou, French Guiana. 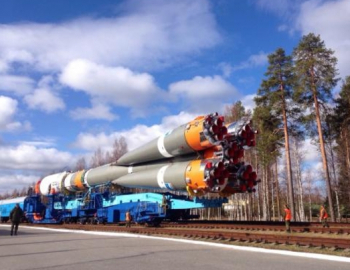 Russia’s other workhorse rocket, Proton, has not flown since 9 June last year. The lull in activity has in part been down to manufacturing defects and quality control issues affecting Russia’s production of rocket engines. A contractor was found to have been using cheaper materials in place of precious metals in alloys used to make parts of the engines. Seventy-one Proton engines and a number of Soyuz engines were recalled for inspection and repair. Reliability concerns have lingered around Russia’s launch fleet in recent years, with Proton failing ten times since 2007 and Soyuz experiencing seven failures in the last eight years. Two Rokots and a Zenit have also failed in the last decade, while Russia’s flagship Fobos-Grunt mission to Mars never left low Earth orbit after the spacecraft itself malfunctioned. In 2016, Russia experienced just one launch failure – with a Soyuz-U rocket suffering a third stage failure during December’s attempted launch of the Progress MS-04 vehicle to resupply the International Space Station. Despite this, there were two near-misses: a Soyuz-2-1b underperformed during the launch of a GLONASS navigation satellite last May, and the Proton launch in June suffered a second stage engine failure. In both cases the rockets’ upper stages – Fregat-M and Briz-M respectively – were able to alter their flight plans and inject the satellites into their planned orbits despite the anomalies. Against this backdrop, Russia has also found its finances squeezed, partially due to international sanctions over the country’s occupation of Crimea. Proton is scheduled to return to flight at the start of next month, ending the longest gap between launches in its history. In the longer term, Russia is introducing new rockets like the Angara to replace its aging fleet of rockets. Soyuz can trace its design back to the R-7, the world’s first intercontinental ballistic missile. Thursday’s launch came ten days after the sixtieth anniversary of the missile’s first flight on 15 May 1957. The R-7, which was designed by Sergei Korolev, was used later the same year to launch Sputnik, the first satellite. With the addition of an upper stage, the missile formed the basis of the Vostok rocket which carried Yuri Gagarin into space in 1961 aboard the Vostok 1 mission. All manned space missions launched by the Soviet Union or Russia have been carried to orbit aboard rockets derived from the R-7. Soyuz itself first flew in 1966, with early launches carrying test flights of the Soyuz spacecraft. Initially, the Soyuz was used exclusively for the Soviet Union’s manned space program, with military launches using the earlier Vostok and Voskhod versions of the R-7. In 1973, the Soyuz-U rocket was introduced, with the intention of being a single, common vehicle to replace the earlier configurations. Soyuz-U would become the single most-launched rocket in history, finally retiring from service earlier this year after almost eight hundred flights. Thursday’s launch used the Soyuz-2-1b version of the rocket, equipped with a Fregat-M upper stage. This configuration made for a four-stage rocket – according to the Russian convention of labeling the rocket’s four strap-on boosters as the first stage and the core the second stage, despite both being ground-lit. Soyuz-2-1b is, along with the Soyuz-2-1a, the result of a project to modernize the Soyuz vehicle. The Soyuz-2-1b first flew in late 2006. The first stage of the Soyuz consists of four boosters, designated Blok B, V G and D. Powered by RD-107A engines, these are clustered around the core – second – stage, or Blok A. Blok A is powered by a single RD-108A engine. Both the boosters and core stage ignited approximately seventeen seconds before the rocket is due to lift off, slowly ramping up to full thrust. The first stage burned for the first 118 seconds of the flight. At this point the four boosters will separated and fell away from the rocket, making a pattern known as the Korolev Cross, after Sergei Korolev. The second stage continued firing for a further 170 seconds before separating. The third stage, powered by an RD-0124 engine, burned for around four and a half minutes. Following the end of third stage flight, the fourth stage – Fregat – and the payload remained on a suborbital trajectory. Shortly after third stage separation, Fregat ignited for the first in a series of burns to carry the Tundra satellite into its planned orbit. To achieve the necessary Molniya orbit, Fregat is likely flying to a three-burn mission profile which will last several hours before spacecraft separation occurs. A restartable, storable-propellant, upper stage, Fregat is manufactured by NPO Lavochkin and is derived from the propulsion system of spacecraft that the Soviet Union constructed to explore Mars. Fregat first flew in 2000, atop a Soyuz-U rocket as part of a demonstration launch that also carried the European Space Agency’s Inflatable Reentry and Descent Technology (IRDT) experiment. Fregat is powered by an S5.92 engine. Soyuz lifted off from Pad 4 of Site 43 at the Plesetsk Cosmodrome in Northwest Russia. Russia’s main military launch site, Plesetsk originally served as a missile base housing the operational deployment of the R-7A missile in the early 1960s. Site 43/4 is one of four pads built for R-7 vehicles at Plesetsk, with Sites 41/1, 16/2 and 43/3 also housing launch pads. 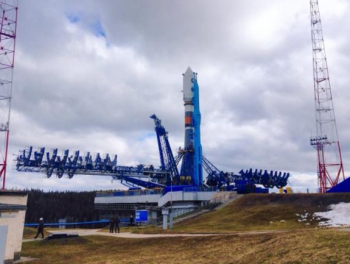 Pad 43/4 is the only R-7 pad still operational at Plesetsk: 41/1 has been dismantled and the other pads have not been used since the retirement of the Soyuz-U and Molniya-M rockets as work is needed to convert them for the Soyuz-2. The Tundra launch was the twenty-eighth of the year worldwide – and the fifth for Russia and the Soyuz rocket. The next Soyuz mission is scheduled for 14 June, with a Soyuz-2-1a vehicle to fly from the Baikonur Cosmodrome carrying Progress MS-06, an unmanned resupply mission to the International Space Station.